NIA CHARLESTOWN NEVIS (JANUARY 17, 2019) — The Nevis Housing and Land Development Corporation’s (NHLDC) first shipment of aggregate for the year from the government-owned quarry at New River, left the Long Point Port bound for St. Kitts Masonry Products Limited on January 16, 2019. Hon. 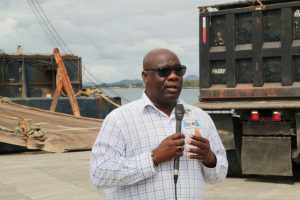 Alexis Jeffers, Deputy Premier of Nevis, Minister of Natural Resources and Chairman of the NHLDC Board of Directors, who was on the scene while the 3,000 ton barge was being loaded at the port, said another shipment was already in the making for sister island St. Kitts. “Today’s activity is one that should have taken place just about a week ago but there was some issue with the vessel that was unable to come but is here today. “We are hoping after this particular shipment is offloaded maybe in another 10 days thereabout we should be able to provide the St. Kitts Masonry Products with another shipment. We are gearing up to do so,” he said. The shipment to St. Kitts is not the first. In 2018 there were four in addition to other aggregate shipments abroad. 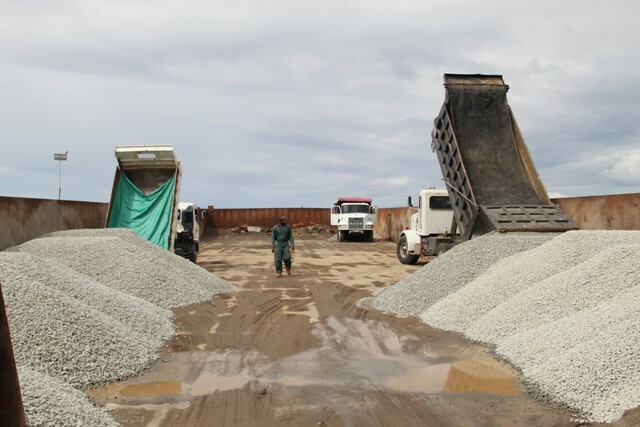 The NHLDC began filling orders for aggregate outside of St. Kitts and Nevis in 2017, with the first shipment to St. Maarten, with at least two to Guyana in 2018. The budding export industry continues to rake in funds for the corporation. In 2017 the quarry income was $ 950,591.20 for base material and $132,657.82 for stone. The expenditure for that period was $215,469.54. In 2018, the income was $1,319,284.70 for base material and $446,849.69 for stone. The expenditure was $233,654.41. Mr. Jeffers explained that while the export for the corporation continues to grow, material from the quarry is also supplied to both of the concrete plants on Nevis. “We are currently supplying both concrete plants on the island and those are the Oualie Masonry Products Ltd. and also Dan’s [Trucking and] Redi-Mix Ltd.. They purchase all of their stones and sand material from us and it has always been our effort at the government-owned quarry to ensure that we have the level of production there to ensure that we can satisfy the local market,” he said. In 2017, the NIA had invested more than $1.6million at the quarry in an effort to enhance the quality of products offered there.